Serenity Now: Fall Pumpkin Decor on My "Mantel"
It's tough to use what you have sometimes, but I think it makes for even more creative creations! Love the pumpkins. Love your fantel! I need to learn to have fun while waiting... sometimes I just want everything to come together now. :) Thanks for the inspiration. I think your "fantel" looks great. I love that you state that part of the fun is the waiting. 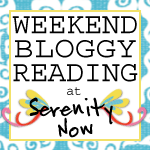 It's so easy to adopt a "I-want-it-all-now" attitude, which quickly leads to wastefulness or resentment. Joy in the waiting is a much better way to go! This is too cute! Very seasonal with a touch of whimsy. You're way ahead of me with decorating. I love the polka dot pumpkins. I going simplier this year and those are on the top of my list. Your fantel looks great. 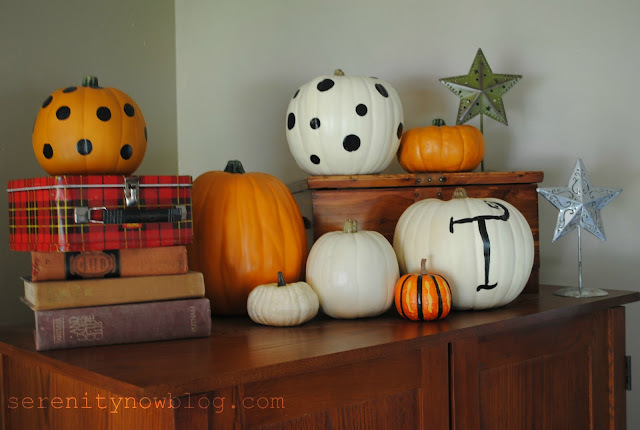 I love what you did with the polka dots on the pumpkins and the painted initial. The whole set up is so cute. Love the polka dot pumpkins! I am so behind, haven't even started decorating for fall. I love the way your's turned out. Like you I also tried to use what I had. It does make for a challange but it's nice knowing you didn't spend a bunch of money. I am also linked up at Layla's today. 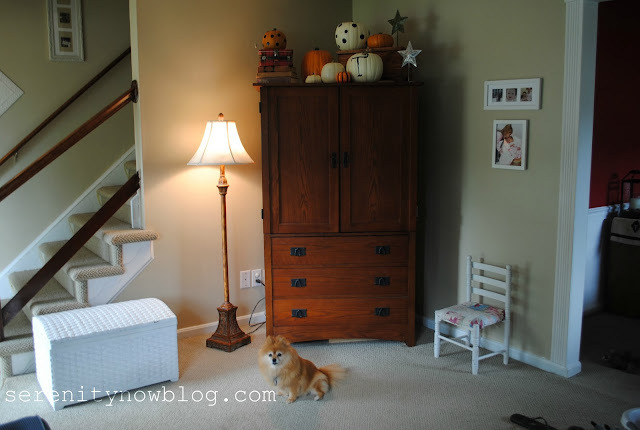 You can check mine out www.colortransformedfamily.com to see what I used from around the house. I love the polka dots on your pumpkins. It adds a nice fun touch. 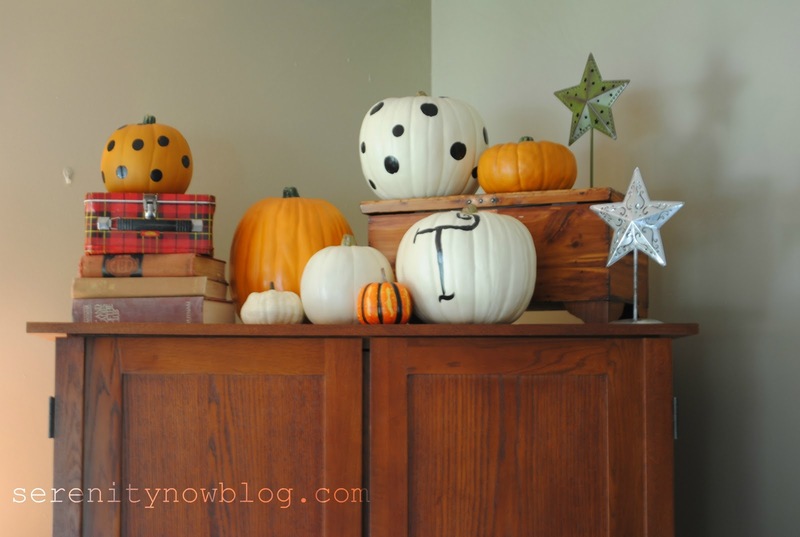 I love those painted pumpkins! Especially the polka dotted ones! REally cute and yes, you have to use what you have! I am queen of that as funds don't often allow for me to do as I wish. Creativity is always necessary! I love your "non-mantel"! Pupmkins, books and great plaid lunchbox! A happy spot indeed! I ♥ your talent! Thanks for the inspiration. :) I tend to use what I already have but now and again I will switch out a few pieces. This year I got a crow in a dress for my porch scape. We didn't have a mantle either until I bought one at a antique store. I decided I wasn't going to live in another house without a mantle...HA! Well, I fixed that right away. I mean, really, who seals off fire places in a 160 year old house???...sheeesh! love that you mixed the white and the orange ones, and that tin just makes it! Love the different colors you used! For years I would do the same thing. We didn't have a fire place and I would decorate the top of our TV unit. Great photos! Your fantel looks wonderful! I give you alot of credit for working with what you have. I *try* so hard to do this myself & sometimes I'm successful (it does make you more creative) & sometimes I'm not. I love your fake mantel, until last fall when I bought myself a real fake mantel at the flea market, I also used the top of my tv cabinet! 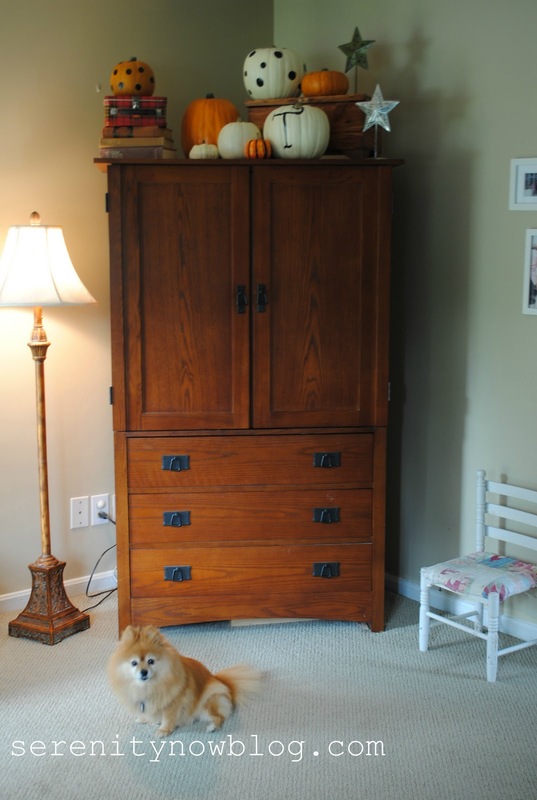 Your pumpkins are super cute and so is your pom! Love the painted pumpkins! Very cute. I, too, am reusing most everything this year. I even dismantled a wreath and a few other things and used the leaves, etc. for other purposes. Felt good not spending a fortune and still getting a look I liked! I guess a little of both for me... I really don't have much yet but not a whole lotta money to get anything new. Yours looks great though! 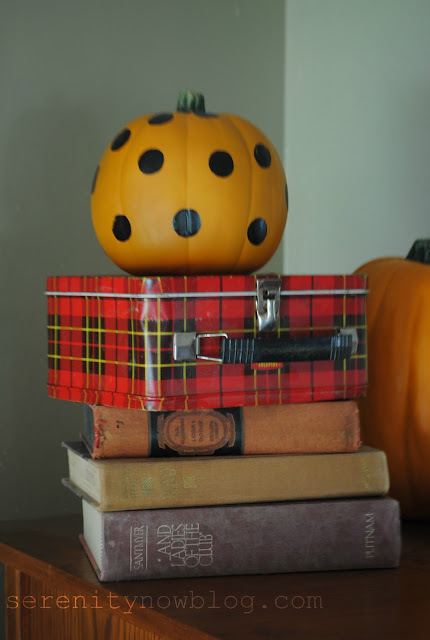 Those polka dot pumpkins are so fun! I give you alot of credit for working with what you have, i love what you did. Your fantel looks great. I love how you mixed vintage pieces with some new things. I'm like you, I'm not buying any new decorations with the exception of maybe some fresh gourds. I can't resist those! Let us know when your slipcover comes in. I've always wondered if they work or if they slip around. you rocked the polka dots! So cute! I'm totally copying that for my house! So, so cute! I love your painted pumpkins and I had that same lunch box when I was a kid! Everything looks beautiful, love the doggie! Love your pumpkin compilation Amanda! I need to get on the fall decorating. Pinterest has been inspiring me left and right so I am going to try to make most of our decor this year. Now that I've banned myself from Target there is no chance of me just buying whatever I see there to cover my home in holiday cheer. Keep sharing! Love seeing what you create! This looks so cute! I lvoe the stars. Those are a great find. I've also resisted the urge to buy anything this year. I don't think I'll get around to putting most of my "stuff" out, but I do want to add a little fall to the house even though we're still getting settled. Amanda your vignette looks great, very fun!! 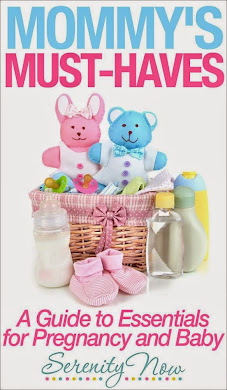 I am using mostly pieces I already had and anything added is inexpensive!! It does add to creativity! Amanda --- it is all so pretty!! I love those stars. I love that you used what you had. And it all looks so pretty!